I make no secret of the fact that I love cheese. So it should come as no shock to you that my kids also love cheese. 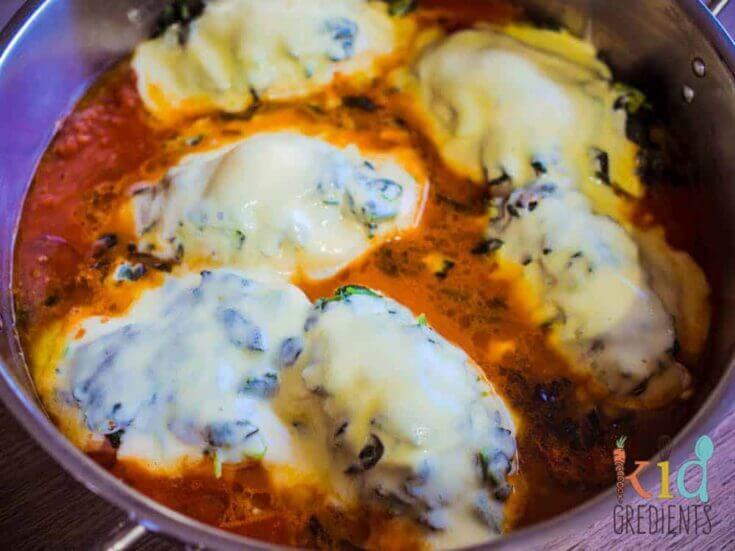 This dish- chicken campagnola is combines chicken with spinach, cheese and a tomato sugo to make the most perfect of dinners. I’ve been making it for as long as I can remember. I had it for the first time in a restaurant in the south of Italy in Sorrento, where they called it chicken campagnola. That basically means countryside chicken. 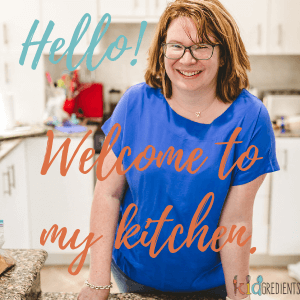 I’ve been wanting to try this out on the kids, but haven’t until now…and I’m kicking myself….because they loved it! 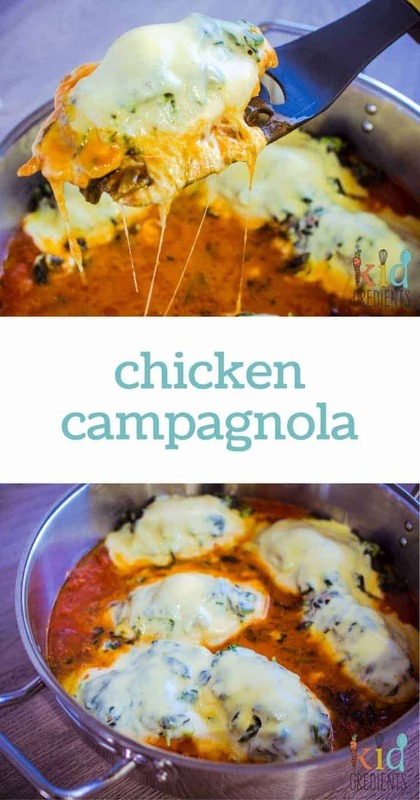 Chicken campagnola is such a simple, yet very effective way of getting a delicious one pot chicken dish to the table, without too many complications, which when you have kids…is exactly what you need. i don’t know why I was so sure they wouldn’t like it…what is there not to like about chicken with spinach, cheese and a tomato sugo? If you’re wondering what I’m talking about when I say sugo, you can check out this post where I talk about the sugo that I make and fill my freezer with which is perfect for this recipe. You could also cheat and use a basil and tomato pasta sauce. Why is this dish so yummy? I think it’s the simplicity of the flavours and the fact that it’s got stretchy mozzarella on top. I love stretchy mozzarella. You don’t have to buy a fresh mozzarella, in fact it’s kind of wasted on this dish, so get the yellow pear shaped ball instead. Being done in one pot on the stove means that all you need to do to get dinner ready is steam some veggies and you’re good to go! You can also cook rice if you want to absorb the sugo, or just use some crusty bread. 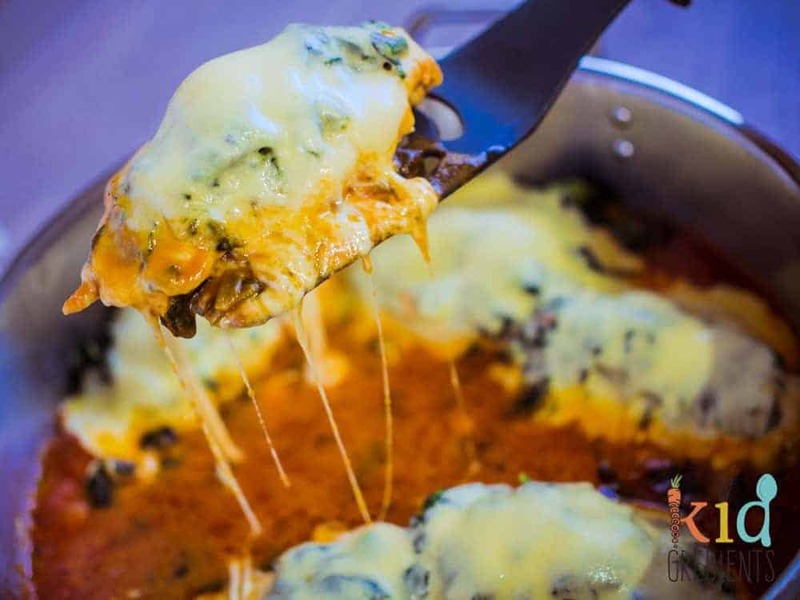 I have to admit I love me a one pot stove top meal…because I hate clean up! 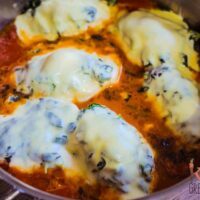 Chicken campagnola, chicken with spinach, cheese and a tomato sugo, a one pot chicken dinner that looks and tastes amazing.Super simple recipe kids love! Cook the chicken breasts until golden on both sides. 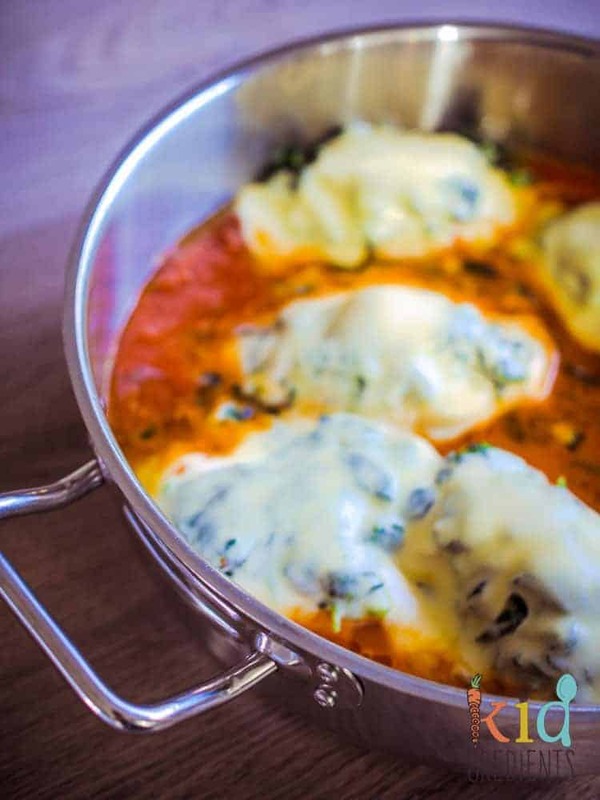 Top with the spinach and mozzarella. Pour the sauce around the chicken breasts, so it is just touching the mozzarella, for presentations sake, try not to get any sugo on top! Put a lid on the pan and cook for 15 minutes or until the mozzarella is completely melted. Serve from the pan with extra sauce poured around for dipping bread into it. Mmmm we are a cheese loving family too! You had me at stretchy and gooey! Oh so yummy. I love cheese with a passion too. Everything tastes better with cheese!